As part of the Society of Graphic Designers of Canada Executive Committee I worked with Rethink Communications and Giant Ant to create a program promotion and packaging for the Icograda Design Week 2010 conference in Vancouver, Canada. Rethink had created an extensive identity for the conference and I was tasked with interpreting it into a video; a new currency of "design dollars", the real-world value of design. 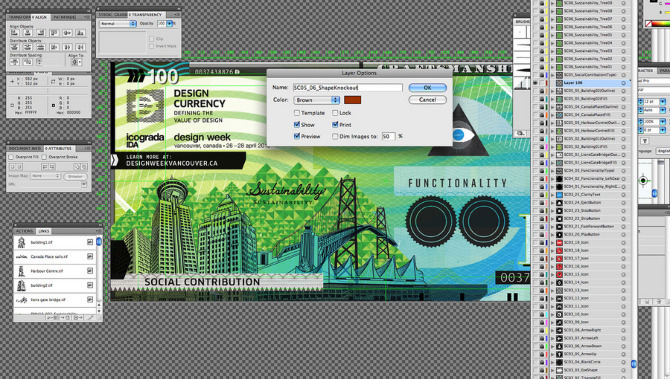 Rethink's design of a 100 design-dollar bill. At the beginning of this project I worked with the Rethink team to brainstorm a 60-second advertisement of the conference. We decided that it would be visually compelling to design a bank note and stumbled across the idea of creating a flip-book animation by using a standard bank teller's note counter. I assisted with the creation of a storyboard and visual styleframes and then we split into two teams; Rethink designed a unique 100 design-dollar bank note and I worked with Giant Ant to figure out how everything could be animated. We purchased a note counter and I began experimenting. I removed pieces of the plastic shell to increase the viewing angles of each bill as it passed through the machine and then I calculated the speed bills were processed, the maximum amount of bills that could fit in the machines "hopper", and the correct camera framerate to photograph everything correctly. In addition to this I painstakingly deconstructed the elements of Rethink's 100 dollar bill and created a digital animation that would be printed on over 2000—double-sided—sheets of paper. Over a 12-hour shoot, Rethink, Giant Ant and I sequentially photographed stacks of bills passing through the note-counter. Due to the counters' capacity and the thickness of our bills we could process a maximum of 25 bills per shot, which I later bridged into a single animation. Once complete we released a promotional video before the conference and then edited alternate angles into title sequence and individual titles cards that were shown before each presenter spoke at the 3-day conference.